By helping fillings to last longer: properly preparing a tooth for a filling requires removing decayed and diseased tissue first. Lasers are the perfect tool for this important task. They dissolve tooth decay instantly and completely, ensuring better outcomes for the patient. By making root canals more successful than ever before: root canals have long been the preferred method for saving a tooth that might otherwise be lost. But, in the past, root canals could sometimes fail due to infected nerves or tissue that remained in the cavity. Lasers make it easier for dentists to catch and treat these problem areas, ensuring better long-term results for patients. Treating canker sores: anyone who has ever suffered from a canker sore knows how painful the experience can be. Laser therapy relieves the discomfort associated with these annoying ulcers, enabling the patient to feel better. Making biopsies better: a biopsy is an essential step in treating potential cases of oral cancer. New pinpoint lasers enable the dentist to excise the needed tissue with minimal disruption to the patient’s life. Whitening teeth faster: all of us want whiter teeth. But traditional treatments such as gels can take too long to fit the patient’s schedule. 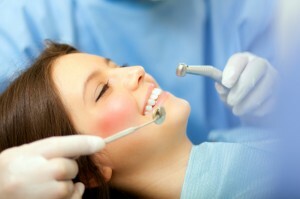 Dental lasers help to speed up the process, creating better results in less time. Much of the apprehension people feel during a typical dental visit centers on the treatment experience itself, not the eventual benefits of the procedure. For example, drills and scalpels can make the patient feel anxious, even though these traditional tools are sometimes essential. Lasers minimize the need for these instruments, helping the patient to relax and get the care he or she needs. Laser therapy is at the forefront of emerging dental technology. This limits the current uses to which dentists can put this gentle and efficient tool. For example, lasers are ineffective at treating teeth with fillings. As of right now, they cannot completely eliminate the need for a dental drill. This means that, for the time being, lasers will play a supplemental, not primary role in providing patient care. Therapeutic lasers are just one way that dental medicine is always getting better. Today’s patients enjoy advantages undreamt of in years past. So don’t let misconceptions based on outdated information keep you from getting the treatment you need. Make an appointment to see your dentist soon. You’ll soon be on your way to a better, brighter smile. Dr. Leslie Metzger stays at the forefront of dental advances through continuous training and research. She studied dentistry at the Ohio State University College of Dentistry and is a proud member of the American Dental Association (ADA). You can reach her office online or by calling (248) 476-3410.